Guerrilla Girls, “What Do These Men Have in Common?” Offset print, 1995. Almost immediately after their 1985 debut, the Guerrilla Girls’ street posters made a strong impression. Initially focused around the lack of representation of women in galleries, by the 1990s Guerrilla Girls posters pointed out other political issues of concern for women. Today, they are admired both for their politics and art. A display of vintage Guerrilla Girls posters can currently be seen in the Whitney Museum exhibition An Incomplete History of Protest: Selections from the Whitney’s Collection, 1940–2017. Gallery 98 recently unearthed an unusual rarity while helping to assemble a collection of Guerrilla Girls posters for an upcoming street-art exhibition in California. Controversy followed the Guggenheim Museum’s 1992 announcement of a new downtown branch, with an inaugural exhibition that was to include only white male artists. 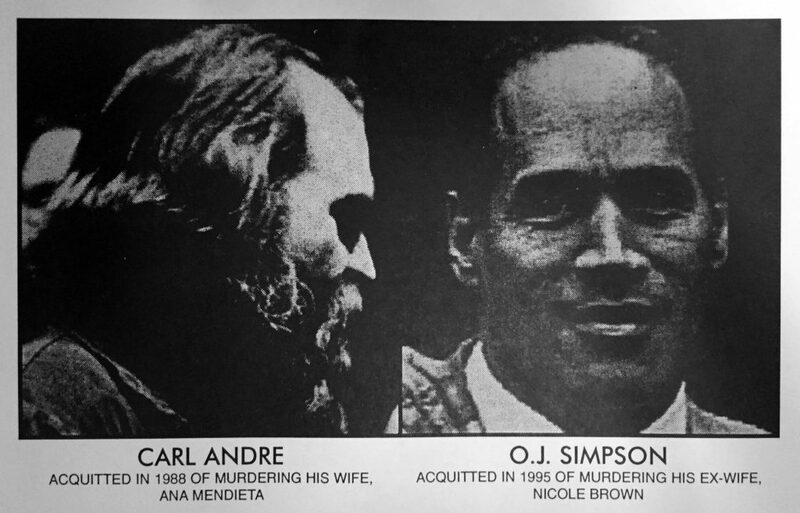 Among the roster was Carl Andre, still widely condemned for the death of his wife, artist Ana Mendieta, for which he had been acquitted in court. In memory of Mendieta, who had founded the gallery A.I.R. with other women artists, the Guerrilla Girls and the Women’s Action Coalition both picketed the Guggenheim opening. A few years later, the highly publicized acquittal of O.J. 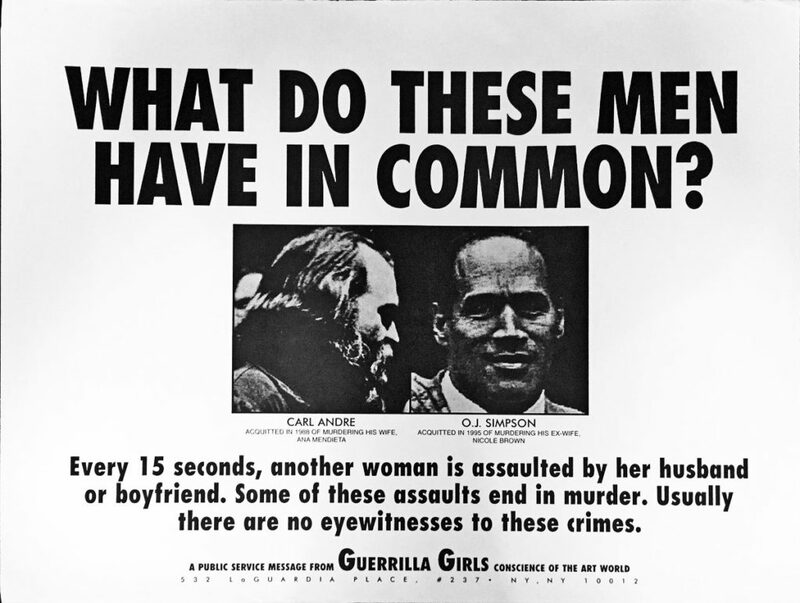 Simpson in the murder of his wife, Nicole Brown, evoked comparisons to the Andre case, and inspired the Guerrilla Girls poster seen here. Gallery 98’s 2014 Guerrilla Girls exhibition can still be seen at our website.